The new Ford C-MAX Estate is a lot like Ford’s five-seater MPVs of old; it’s good to drive, practical and efficient. All in all, it offers plenty of value for money. It’s a family car aimed at those who like the Ford brand and who don’t want to get saddled with an MPV that’s dull to drive. Bigger than the B-MAX but still as adept as an Estate on the road, it’s primed to be a success. However, cars like this need to be able to offer more than just a good driving experience. OSV takes a closer look at what it’s all about with our 2018 Ford C-MAX Estate review. Ford has a long history in car manufacturing. Read our summary of the last century here. It’s not quite a sports car – but it’s very sporty to drive. Its electrically assisted steering is a massive bonus, making the car just as engaging as many other Ford’s. Each model comes with damping that feels nice and controlled, smoothing out most road surfaces without causing body roll to be an issue. True, the C-MAX gets a firmer suspension setup than some of its rivals, but it’s still a comfortable car. Its steering is precise and light when you’re in the towns and cities, and it sharpens up even more when you’re out on the motorway. As such, the C-MAX is a car that excels pretty much anywhere you want to take it. A front-wheel-drive system offers lots of grip, while clever torque vectoring tech gives you more confidence to tackle bends with pace. In terms of its engines, the EcoBoost petrol units are tailor-made for lower mileage drivers. A 1.0-litre 98bhp variant sits at the bottom of the range, but while it’s fairly quiet it’s probably going to be too underpowered for most buyers. It posts a 0-62 time of 12.6 seconds, whereas the bigger 123bhp variant covers the same sprint in 11.4 seconds. The biggest problem with both engines is that you’ll be required to use a heavy foot to get the best out of them, and this will cause economy to drop. A 1.6-litre petrol engine is your alternative. It does without turbochargers, isn’t as flexible as the 1.0-litre engines, costs more to run and gets you from rest to 62mph in 11.5 seconds. Our top pick is the 123bhp EcoBoost unit. The C-MAX sports a modern-looking cabin that gets the same top quality treatment as a lot of Ford products in 2018. This means you can expect top-notch materials, neat dials and piano-black for the centre console. It’s lovely stuff and top-spec models also get a classy and useful SYNC3 touchscreen as standard, which replaces the outgoing SYNC2 screen. It comes with a main screen that’s overlaid with pretty big shortcut keys for the stereo and your phone. Frustratingly, though, sat-nav is a £300 optional extra. 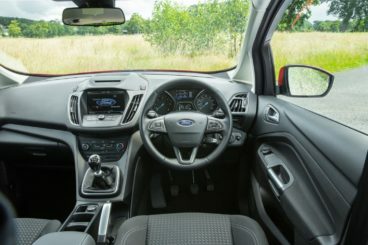 There’s plenty of design flair to make you feel welcome, and there’s no doubt that Ford have worked hard on making the interior as presentable as possible. So it’s a shame that the dashboard is a bit fiddly to use, with some of the buttons being on the small side. Is the Ford C-MAX Estate practical? This is quite a small car but it’s still really usable. A 432-litre boot impresses. Fold the rear seats and you can extend it to 1,851-litres. There are rivals with bigger boots, but you can order an intelligent rear bench with your C-MAX that splits 40/20/40. This boosts versatility and means you can switch to a 2+2 layout. With all 3 rear seats up, space is a bit cramped back there. Headroom is good, though, thanks to the high roofline. The car is able to boast plenty of storage spaces, too. A deep cubby comes with the versatile centre console, while a usefully shaped glovebox is a great bonus. Standard kit across the range is impressive. The Zetec is now the entry-level C-MAX and it comes with 16” alloys, a digital radio, air conditioning, heated door mirrors and front fog lights. The Titanium model adds bigger alloys, cruise control, a handy start button, climate control and automatic lights and wipers. Move up to the Titanium X model and you benefit from heated front seats, unique alloys, part-leather seats, a panoramic sunroof and xenon headlights. Safety-wise, Ford – and buyers – will be disappointed that this new model only scored 3/5 when it was crash tested by Euro NCAP. The outgoing model scored 5/5. Standard safety kit includes anti-lock brakes, traction control, 6 airbags, electronic stability control and emergency braking assistance. A Driver Assistance Park is well worth adding for £500; it nets you traffic sign recognition, lane departure warning and active city stop. If you want parking aids, you’ll need to snap up the Convenience Pack, which will also set you back £500. Are Fords reliable? Read our unbiased and honest assessment here. Prices for the new car start out from £21,940 and rise to £28,130. For more information on our leasing deals, you can check out our page here. In terms of its running costs, the EcoBoost engines come with stop-start technology, which helps to keep costs down. The 1.0-litre 98bhp unit is able to return 55.4mpg at best and emits 118g/km of CO2. This gives it a BiK rating of 23%, while the bigger 123bhp variant of the same engine is able to return the same numbers. A 1.6-litre petrol engine that does without a turbocharger sits at the top of the range. It’s an older engine and returns 44.1mpg on a good day while emitting 149g/km. That gives it a BiK rating of 28%, which will seem too steep for many buyers. It’s an MPV but you wouldn’t think so from behind the wheel. A rear bench that splits 40/20/40 is a highlight, but there are lots of versatile touches that make the C-MAX so appealing, such as a 12v socket in the back. They’re modern and they come with fuel-saving stop-start tech. Insulation is an issue, especially on the motorway. A Euro NCAP crash test score of just 3/5 will be cause for concern. Let’s see how the car fares against its rivals in the comparison section of our 2018 Ford C-MAX Estate review. The new BMW 2 Series Active Tourer is an upmarket alternative to the C-MAX. It’s comfortable and boasts a top-notch interior. When it comes to entertainment on the road, the BMW is more than a match for the Ford – and this is despite the fact that the car is BMW’s first ever front-wheel-drive model. Their engineers have done a fine job of making sure it’s just as fun as buyers expect a BMW to be. It might be a compact MPV but it’s agile and engaging. In terms of its engines, a turbocharged 1.5-litre petrol engine sits at the bottom of the range. It powers the 218i model and can cover the 0-62 dash in 9.2 seconds, which strikes us as impressive when you consider how small the engine is. If you want more pace and power, a 2.0-litre petrol engine powers the 220i and 225i models. The former can motor its way from a standstill to 62mph in 7.5 seconds, while the latter can do it in just 6.5 seconds. Both engines, then, are just as fast as modern coupes. Running costs? The 218i model is the most frugal and can return almost 49mpg on a good day. It emits 132g/km of CO2. The bigger 220i model benefits from a twin-clutch automatic gearbox, though, and can return 50.4mpg at best. Inside, the BMW really shows its class. This is a fine, high-quality interior that has the Ford well beaten for luxury. It’s also comfortable, quiet and smooth on the move. Its dashboard is typical BMW fare, too; it’s logically arranged, user-friendly and boasts plenty of solid, premium materials. 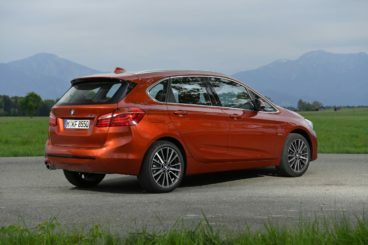 Is the BMW 2 Series Active Tourer practical? This is BMW’s first attempt at an MPV, and while it isn’t as roomy as some rivals, if you’ve got your heart set on a practical BMW, this is the one to go for. There’s a decent amount of room for rear seated passengers, the driver’s seat offers lots of adjustability, and there are lots of handy storage areas dotted around the place. The car comes with a rear bench (as opposed to seats that move individually), and the boot measures 468-litres. Fold the rear seats and you can increase it to 1,510-litres. The new Renault Scenic might not be a BMW but it’s got plenty of style and it’s also got lots of substance. On the road, the Scenic handles a lot like the outgoing model – which is a good thing. It weighs pretty much just the same, is just as agile and composed and boasts the same accurate steering. Body lean is well resisted too, but the Scenic can’t offer as much grip as the Megane. In terms of its engines, a brand new 2018 1.3-litre petrol engine has replaced the old 1.2-litre TCe unit. There are two variations on offer, with the smallest of the pair developing a reasonable 113bhp. It covers the 0-62 dash in 11.3 seconds, while the biggest of the two develops 138bhp and has a 0-62 time of 10.1 seconds. This latter engine can be specified with an automatic transmission and has a wider distribution of power. Running costs? The brand new petrols both return 52.3mpg at best and emit 122g/km of CO2, which gives them a BiK rating of 23%. This makes them marginally cleaner than the outgoing model. Inside, the cabin doesn’t quite live up to the expectations brought on by the car’s exterior – but it’s still a great place to spend your time on the road. Ride quality is a bit of an issue because the car’s wheels are so big (20”), but both the seats and the suspension setup have been optimised to cope with these large alloys. Insulation is good, with minimal road noise making its way into the cabin, but buyers will have to get used to a dashboard that’s more conservatively styled than the exterior. Dark plastics dominate, with only the expansive windscreen ensuring that things aren’t too sombre in here. Meanwhile, build quality and fit and finish give the car a premium feel. 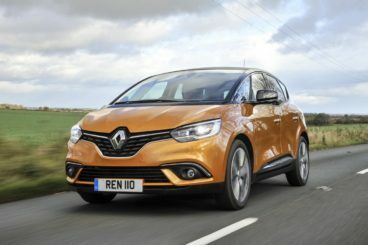 Is the Renault Scenic practical? There’s more room inside the latest model than there was last time, but leg and headroom – oddly enough – seems to have shrunk. The versatile rear seats slide back and forth, while a huge centre console comes with a sliding entry point and can hold up to 13-litres worth of storage. The boot is large and measures 572-litres, while sliding the rear seats increases it to 720. The C-MAX is another MPV from Ford that’s both practical and great to drive. It’s modern, efficient and affordable to buy. 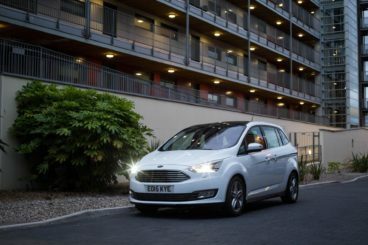 It might not be quite as stylish as the Renault or as upmarket as the BMW, but if you’re a fan of the Ford brand and need a five-seater MPV, then the Ford C-MAX Diesel Estate is a very solid choice.